Blogging and Social Media are now dominating the world-wide web. Bloggers, netizens, and social media experts were now growing and emerging. But the question goes, who among them can be called as the 'real' one since anyone of us now can make our own blog or post in the internet via different social media means. It's glad to know that a bloggers' association in the Metro dubbed as the Metro Blogger gathered the topmost or the elite bloggers of the country. Known bloggers from the different niche like lifestyle, food, travel, and fashion got to know each other in a night filled of fun, toast, and socialization in the country's high-class venue. And the event was called as the "Metro Blogger First Night Out." 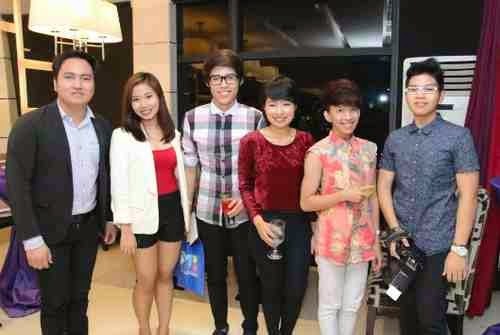 And I'm glad that yours truly was invited in this one of a kind prestige bloggers' event! But before discussing the night that was, have anyone of you already heard about Metro Blogger?! Do you have any idea on what this organization is all about?! Well, let me share you some details about this org. Metro Blogger is actually a Social Circle/Organization of Bloggers around the Metro that aims to be an avenue to broadcast information, event offers, new products and services and campaigns that are of great interest to everyone fuelled by a team of zealous writers who share similar views about personal and skilled know-how in life. 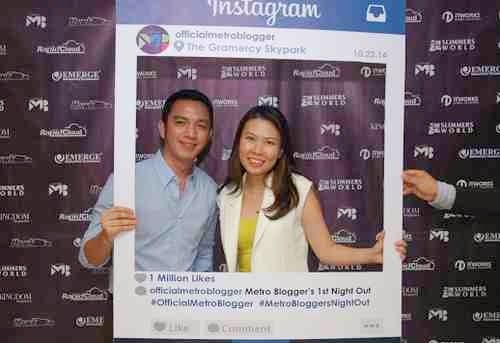 And to commence their activities, Metro Blogger spearheaded their very first bloggers' night out at the Gramercy Skypark on the night of October 22, 2014. The program proper started at 6pm and ended in a cocktail party late at night. Ms. Anna Sales, one of Metro Blogger's team coordinator welcomed the guests and bloggers and proposed a toast for the celebration of the first Metro Blogger Night Out. It was then followed by an opening remarks by Mr. Ong Pang Seng, CEO of Rapid Cloud Singapore. Mr. Miller and Ms. Lee, two big bosses of the 2 merging companies pose on the Photo Booth. Courtesy of the Official Photographer of Metro Blogger. The night also served as the merge of the two well-known IT companies. We witnessed the joining of these two tech giants from Singapore and Philippines by a contract signing agreement, Emerge Innovating Technology and ITworks Global Solutions Inc.
After the contract signing a dinner has been served, finger foods and some cocktail drinks has been prepared for the guests. And of course, fun dominated the night as bloggers enjoyed picture-taking ala pictorial in a cute huge Instagram-inspired photobooth! Camaraderie then filled the air! Beautiful and Gorgeous Bloggers who attended the event. Representatives of the Kingdom Magazine. a. Rapid Cloud Singapore - a top Singapore Web Hosting and E-Business Consulting Company specializing in Domain Name Registration, Dedicated Server Hosting, Website Design, Website Development and Application Programming. Rapid Cloud Singapore is a company that delivers results; other SEO Services includes Search Engine Optimization, Pay Per Click or Search Marketing, Directory Submission, Link Popularity Building and Social Media Marketing. b. HAWK Bags - a brand that has long been recognized for its craftsmanship and quality. The brand has a wide range of bags suited to match every lifestyle delivering high quality products with the finest materials available, superior craftsmanship, durability, innovation and exceptional design with practical functionality. We may visit the hawk bags' social media via www.facebook.com/hawkbags and www.instagram.com/hawkbag. c. Slimmers World International - the Philippines’ foremost name in Slimming, Health, Fitness and Beauty with over 35 years of excellent service in providing great bodies & great skin. Slimmers World currently operates in twenty three (23) centers in Asia. Slimmers World will be celebrating their Mr. and Ms. Great Bodies 2014. For more details and ticket inquiries call 536-3333 | 091-SLIMMERS. d. Emerge Systems Sdn. Bhd. f. Kingdom Magazine - will feature the said event. Before setting home they gave us some loot bag which includes a pen, notebook, button pin, Emerge Brochure and a Slimmer’s World Gift Certificate all exclusive for the Metro Blogger Guests. Many thanks to Metroblogger's Choy Suarez for his photos during the event. Choy served as the official photographer on the said night.